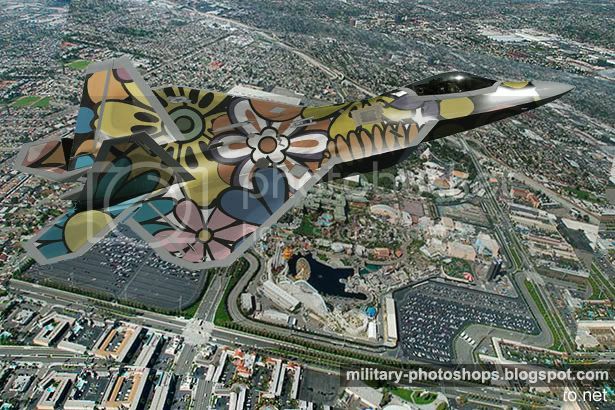 USAF F-22 Raptor flying over Disney Land California Adventure® Park. [BBN:Defence Reporter] : Following the financial constraints enveloping the USAF, Pentagon gave a go ahead for USAF F:/A-22 Raptors to fly demonstrations at Disney Land California in order to generate revenue. The shows will occur each Sunday, and the ticket will cost about 100 USD.
" We face significant fiscal constraints and are making tough decisions about the best ways to continue providing combat airpower to warfighting commanders, which is what we do as the Air Force’s primary force provider." said a USAF spokesman. The Raptors flying in these Demonstrations will be painted in special bright color schemes, one as seen in above pic is painted in Floral pattern. The other one painted in Hello Kitty pink color scheme can be seen here, here, and here.